Classes come with roles such as “tank”, “healer”, “ranged”, “melee”, “crowd control”, etc. If you want to join a group that needs a tank, but your class is about melee damage, you can't join the group. The beginning of the game is a bad time to choose a class, which impacts you for the entire game. It's too early in the game to know what style of play you might like or what kind of roles are needed/useful. By the time you can make this decision it's too late; you've already invested lots of time into the game. Either you throw all that away or you keep playing the class that's not best for you. Every class's play style can be considered “content”, and by choosing just one the player is missing out on other styles of play. As a game developer, if you have 5 classes, and players only play one of these on average, you're spending a lot of money on “content” that most players won't see, especially if armor/weapons are written for just a few classes in mind. In Diablo 2, you picked a class but you could also customize that class by choosing skills as you level up. For example, Barbarians could choose skills such as Taunt or Double Swing. The skills had level requirements and prerequisites; for example, Double Swing was only available if you already had Bash. 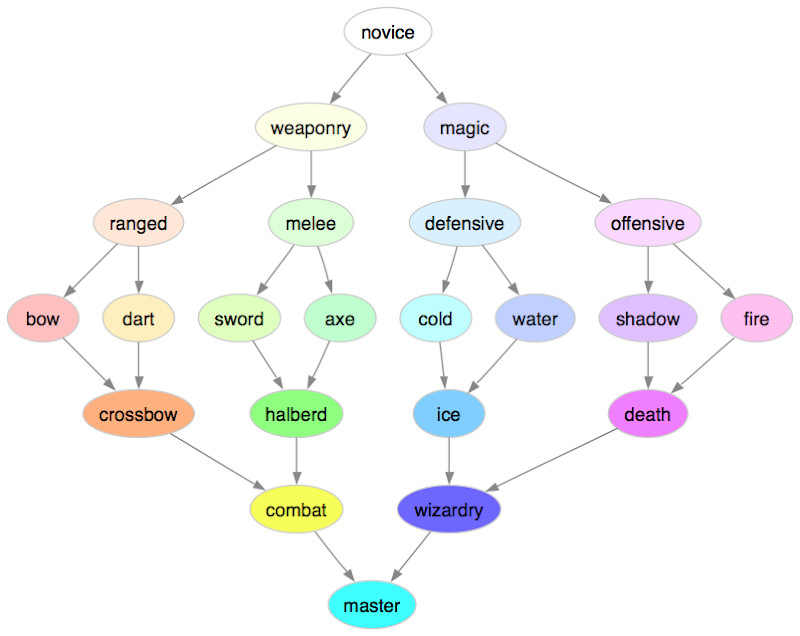 The trees were divided into three specialties per class; each of these effectively acts as a sub-class, so you had 15 styles of play instead of just 5 classes. The skills available to you were fairly limited at the beginning of the game, so you're not overwhelmed, and you don't have to make your choices at the beginning. This partially addresses complaint #2. In Guild Wars and Titan Quest, you get to pick two classes. Multiclassing has been around since the D&D days, but these two games makes two classes the default and one class an option. Multiple classes can help with complaint #1, since everyone has two roles. It also helps with complaint #3, by adding lots of variety without having to create new content around it. In Silverfall, World of Warcraft, and Titan Quest, I can change my skills later in the game, but not my class. WoW also has hybrid classes such as druid and shaman that can perform multiple roles. This also helps slightly with complaint #1, but it's quite a hassle. (Recently, WoW introduced “dual specs”, which help quite a bit by letting you set up two sets of skills that can be swapped with one button.) Being able to change my skills later greatly increased my desire to experiment. In Diablo 2, I would pick skills based on the recommendations of others. Decisions you can't change are more likely to be conservative. But in WoW, I am much more willing to try out new things, because I can undo them. In Dungeon Siege II, there are skill trees but no classes. You essentially define your class by choosing skills along the way, but you don't have to decide anything at the beginning of the game. Titan Quest also delays the decision-making of your first and second classes. Either approach addresses complaint #2. Another way to address all three complaints is to have more than one character, each one trying out a different class and play style. But when playing these characters, you start over from scratch. After you've played for a short time, you get to choose weaponry or magic. I choose weaponry. After playing more and leveling up with weaponry skills, I am able to specialize again, and I learn melee. After learning all the melee skills, I specialize in swords. After a few more levels, I am now fully specialized by mastering swords, and there's no more for me to learn. This is the equivalent of “level 80” in WoW. At this point, it's time to try the branches I hadn't tried. This could either be by starting over with a new character at the novice level; or it could be by restoring a previous savegame where I was still at weaponry (playing a “clone” in a scifi setting), and choosing the ranged path instead; or it could be by using my current character to go back and learn ranged attacks. I don't know which of those approaches would be best for a game. In any case, I'm now trying out other play styles, just as with current RPGs. Where this design differs is that there's something gained in-game by learning multiple specialties. This is the lower half of the diagram. If I master both the sword and axe, that unlocks the halberd. If I master both ice and death magic, it unlocks wizardry skills. By playing and mastering all types of characters, I become a Master. An open question is how you handle the huge number of skills once you've pursued multiple paths. Titan Quest and Guild Wars limit your classes to two, so that it's not too bad. WoW lets you have two sets of skills, and you can swap back and forth at any time. Guild Wars further gives you a fixed number of skills at any time, and you can swap these out when you're in a major city. In a scifi setting, such as a robot or spaceship based game, you could assign the skills to the robot/vehicle you're in, and then jump into a different robot/vehicle to swap skills (Wild Shadow Studios is working on a tank-based MMO that does this). Choosing sets of skills before you go into combat seems like a reasonable way to limit the complexity, and also encourage planning ahead. This skill graph addresses complaint #2: you don't have to make permanent choices at all, and the choices you make come after you've been playing the game for a bit. It also addresses #3: there's a path for the player to experience all the “content” the developers create. It partially addresses #1, by allowing you to play different roles at different times. Novice players can follow a recommended path to specialize in just one “class”, whereas experienced players can experiment more and try out new combinations. I think it could be fun to play with such a system, but I'm not planning to write an RPG any time soon. I've been trying to get better at throwing away code. I used to be a packrat. I saved every receipt, every bill, every check, every bank statement, every page of notes I took in class, every textbook, and so on. Eventually I started letting go of most of these things. Class notes were the hardest though. I had put so much effort into them; how I could throw them out? I realized that I was making the same mistake that I make with market prices. I expect prices to reflect the cost of making the item. But in many cases, prices reflect what it's worth to the buyer. In this case, I was saving my notes because they cost a lot to produce. But they don't have much value to me in terms of looking things up. I haven't used them in over ten years, and Wikipedia and other online sources are better references. So I finally threw away my class notes. I find that I have the same problem with code. It takes effort to write, so I feel like I should save it. But sometimes it's the wrong code or it's solving the wrong problem. There are times when the best thing to do is to throw it away. To make it easier to throw away code, I'm trying to reduce the cost of producing it, especially when I'm less sure about how long I'll need it or whether it's the right way to go. This is not only helpful for me psychologically, but I think it's the right thing to do engineering-wise. Note that this is the opposite of the conventional wisdom — that you should put lots of effort up front into “doing things right”, because it'll pay off later. Keeping costs down recently paid off for me. I had convinced myself that inside an airport or container port, the vehicles could move around in loops, and that would be sufficient for a game. Even if I needed branching, I could change my Path class from having a single next pointer to multiple next pointers. I was quite happy with the vehicle and road representation. I had a coordinate system that allowed vehicles to detect if someone's in front of them, and to slowly come to a stop before they collided. By using a loop I had eliminated the problem of start and end points. A few days later I tried sketching out what the player would do. It turned out that there wasn't much. I spent some time thinking about why Transport Tycoon's station management was interesting, and my prototype was not, and realized that what's interesting is updating the station over time to deal with changes in the game world. If players spent most of their time on updates rather than initial design, the road shouldn't be a loop. It should support adding temporary routes, closing existing routes, demolishing routes, building new routes, and so on. Those operations work better with a completely different representation of roads. And that meant I should throw away my representation and associated code (rendering, etc.). If you look at the class I wrote, it's trivial. Everything's public. There are no getters and setters, no methods, a trivial constructor, and no tests. I tried hard to follow YouArentGonnaNeedIt and DoTheSimplestThingThatCouldPossiblyWork. Throwing it away is easy, because there's so little work put into it. Having the old version saved in version control helps me feel okay with removing the code in the current version. Although I'm throwing away code, there are some ideas I'm keeping. I learned some things, and the first approach is what got me thinking about the new approach. The process was valuable, even if the code was not. And I've started working on the next approach, which I'll try to keep as simple as the first one. I still have a packrat instinct, but I'm working on conquering it. I have been playing Transport Tycoon for a long time. It's my all-time favorite game. TTDPatch is a very impressive set of patches for the game, adding lots of new features that seem like they would be impossible to implement in a patch, especially by authors who don't have access to the source code. Open Transport Tycoon is an open source port/recreation of the game, and it's what I've been playing lately. In Transport Tycoon your goal is to build a transportation empire using buses, trucks, trains, airplanes, and ships. The part I find the most fun is laying out tracks, railroad stations, and train signals. I think most of the players spend most of their time on railroads for this reason. I think I would enjoy the airplane and ship parts of the game more if I had some control over layout. All you can build right now is 6 predefined rectangular airports and 1 ship dock. For several years on the Open Transport Tycoon forums, there's been talk of “modular” airports that would allow players to place hangars, runways, taxiways, and gates to build their own airport. However, airports are implemented with finite state machines that carefully manage multiple airplanes in holding patterns, landing, taking off, taxiing, going to hangars, and stopping at gates. Richk67 has created an impressive patch for custom non-rectangular airports. However his experience has been that the finite state machines are just too complex for players, and his patch is instead aimed at people making addons. Pikka has an alternate proposal, but take a look at the example state machine code for the simple airport. That's way too complex to make players deal with. There have been others who have argued that it should be possible to let players do this, if the GUI was good enough. However, Richk67 actually wrote some code and implemented custom airports, whereas most of the posters are just talking about proposals or ideas, so I generally believe him when he says that the finite state machines are too complex for most players. Dimme's demo shows that there's a different way to build airports that may not lead to the same complexity as the finite state machines. MarkyParky, who works with airports in real life, has good things to say about Dimme's demo, but also talks about holding patterns, which turn out to be more complicated than I imagined. I don't think that realistic holding patterns are necessary but it's something to think about. In any case, I don't think any of the discussions are going to go anywhere. Richk67's patch is the only code I saw, and as far as I can tell, the main developers have rejected his patch. Dimme demonstrated an alternate approach but there's no proposal for how to make it work within the OpenTTD code. Dimme's demo is good. 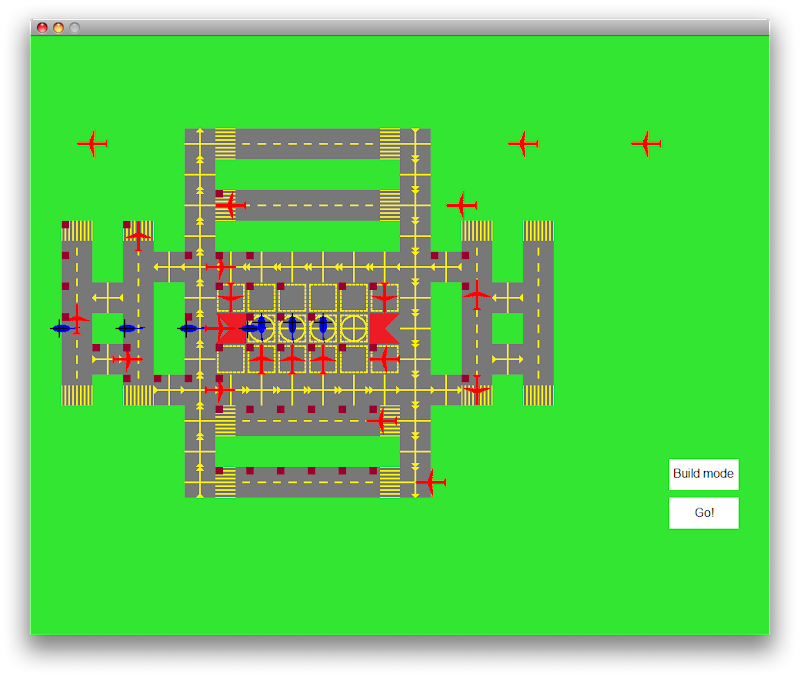 It's simple to use, it demonstrates the idea, and it lets you actually try building an airport to see how it works. After playing with it, I decided I wouldn't build an airport building demo. I think my ideas aren't different enough to make it worth it. However, his demo reminded me that I should be building more demos of ideas I want to explore. Coming up with ideas doesn't teach me as much as trying them out. Update: [2012-08-18] There's a modular airport mod for Cities XL.